When it comes to picture books, I think I'm definitely partial to ones with a clear story arc and memorable characters. When they're just centered around a particular theme without any cohesive plot, I tend to feel rather noncommittal; I can take it or leave it, but either way I won't remember much about it by the next day. Home would be an exception to this rule. It had me on the title page. And I would happily read it again and again and again. You can probably already guess what it's about: each page shows a different home and its occupants . . . which, at first glance, might not sound all that interesting or even original. But keep an open mind. This book takes you to homes you've never thought about or known existed. It begins with the homes you might expect . . . one in the country, one in the city. But it quickly veers off into the unexpected: the lair of thieves, the underwater home of Atlantians, the cozy cottage of a Moonian (with an enviable view of planet Earth). It somehow crosses over all cultures and time periods, showing homes of people, animals, and fictional characters. It pairs the most unlikely houses side by side (that of a Japanese businessman on the left page and the home of a Norse god on the right, for example). It leaves some of the story up to the imagination of the reader: Who do you think lives here? And why do you think they live there? And it ends with the homes of the people most invested in the story--that of the author and the reader. 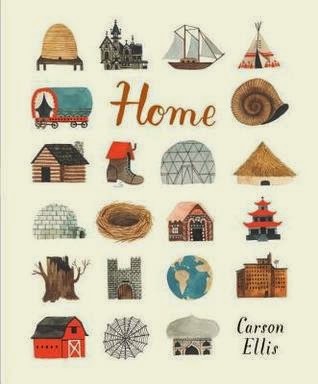 I believe this is the first picture book that Carson Ellis both wrote and illustrated, and the illustrations make the book. I believe they're done in watercolors, and it gives them a subtle and soft look that works very well with the quiet comfort of homes. I'm no judge of this, but it would not surprise me at all if this received some Caldecott recognition come 2016. I've been trying to come up with why I like this book so much in spite of its not following the formula I traditionally like, and I think it comes down to this: it took something so basic and familiar but made me think about it in a new way. People have been living in homes of one kind or another since time began. It doesn't matter where you live in the world, you have a place you go to at the end of the day and usually (hopefully), it is a place that brings you both peace and comfort. My own home is a refuge, a place for me to be with my family where I feel safe and loved. This book captured all of those feelings but added something new, too. It made me realize how vastly different homes can be while still providing those same feelings of happiness and security. It is a beautiful book and one our whole family enjoyed. Many thanks to Candlewick Press for sending us a hardback copy of this book. I was compensated in no other way for this review, and all thoughts and opinions are my own. Ok now I'm looking forward to this one even more! I loved Carson Ellis's work in the mysterious benedict society, Wildwood, and on the decemberist albums, so I was looking forward to this. Now that I know you like it, I'm guessing it's a shoo-in for me. I've been anxiously waiting for the library to get a copy of this. I'm excited to read it.